Hello Jesso: Indonesia Adventures: Do Good. Feel Good. Indonesia Adventures: Do Good. Feel Good. On this trip to Indonesia, I have experienced and seen lots of things that I'll remember forever. However, one of the memories I will treasure the most is volunteering at Taman Bacaan Pelangi (Rainbow Reading Gardens). 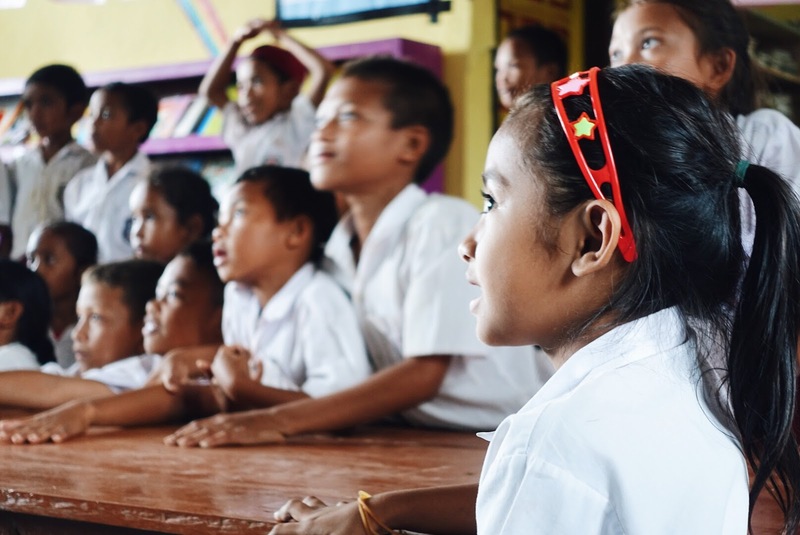 Taman Bacaan Pelangi is a non-profit organisation - founded by the inspiring Nila Tanzil - that establishes children's libraries and strives to improve literacy in remote under developed parts of eastern Indonesia. By improving literacy and encouraging a love of reading, Taman Bacaan Pelangi wants kids to dream BIG. Through books, they hope to broaden the kids horizons and inspire. The nerdy book-loving child that I was could totally get on board with this concept. The library we were going to volunteer at was in Melo, a village located in the East Nusa Tengarra region of Indonesia.We were only going to be there for a few hours, but whilst we were there we would be interacting with the kids - listening to them read, talking, playing, and distributing books. When we arrived, we were split up into groups and headed off with our group of kids. First we had to stand up in front of the class and introduce ourselves and tell them a bit about where we were from. I told them that even though I was Filipino, people in Indonesia thought I was also Indonesian. The kids agreed that I did look Indonesian. After that, the fun began with singing, laughter, and game playing. Our group of kids had a serious set of lungs on them. I'm sure the whole village, if not the whole region could hear them! Then we distributed books and sat down to read with them. The smiles and excitement that the books brought to their faces was heartwarming. Genuinely eager to discover what stories and knowledge lay in these new pages. In fact, here's a picture of me distributing some books. We were meant to inspire the children with tales of travel, but the reality of it is that their smiles, their enthusiasm, and their spirit have inspired me more. This was my first taste of volunteering while travelling, and even though it was only a bite-sized chunk, it felt good to do good. If you would like to find out more about Taman Bacaan Pelangi - what they do, their mission, and how you can get involved, you can here. Melo is about 17km from Labuan Bajo, the jumping off point in Flores to explore the Komodo Islands. If you'd like WIN A FREE TRIP to the KOMODO ISLANDS - you can enter this competition. Competition closes: 26th November. Want to read more about my Indonesia trip?